If you’re a fresher in Leeds, there’s no doubt that you’ll want to spend some time exploring the city and all the fun it has to offer. From great coffee shops to cool bars and shopping districts, this entertainment guide will let you know what’s on in Leeds, the best of Leeds nightlife and which restaurants in Leeds to dine at if you want a good meal. We guarantee you’ll find some places in Leeds where your best university memories will be created. 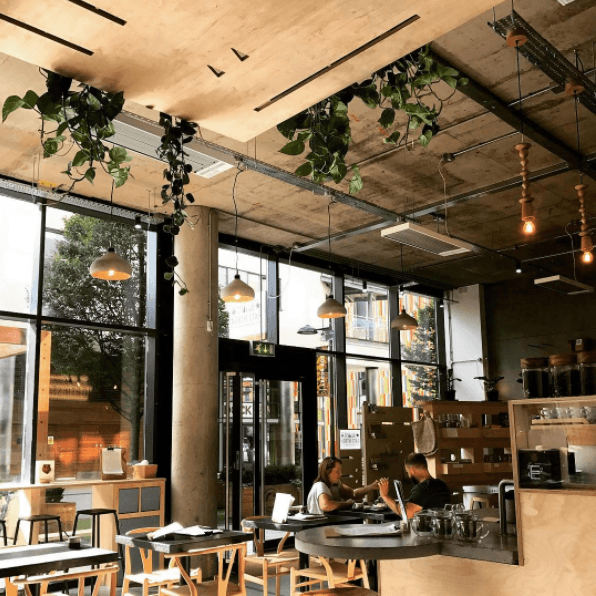 Leeds is not short of great restaurants and places to eat, but the following restaurants in Leeds are firm favourites for their downright casual style, informal setting and friendly-to-the-wallet pricing. Originally just located in The Corn Exchange in Leeds City Centre, Humpit has now expanded to a second Leeds location in Leeds University Union. 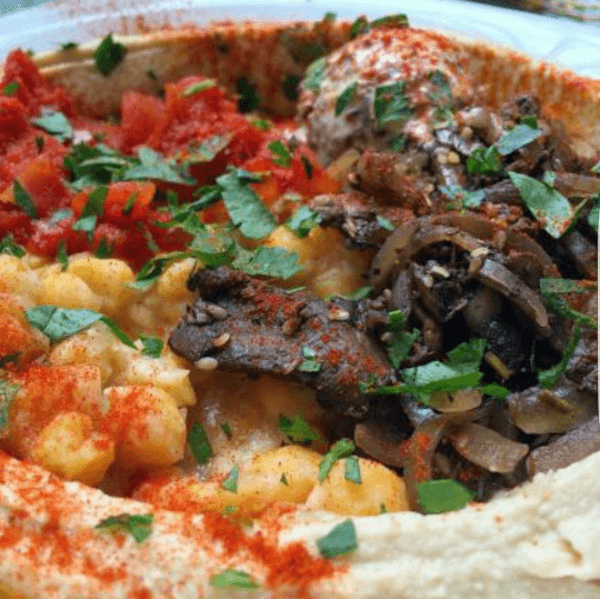 It’s not really a restaurant in Leeds, more of a quick-bite-to-eat kind of place but if you’re a fan of anything falafel, hummus or pita related, you’re going to want to try this place. Get all the tasty food in a bowl and mop it up with freshly baked pita bread. You can even wash down this delicious meal with a glass of home-made lemonade. Well known around Leeds for its quick pace and superb food quality, My Thai is the place to go for a quick catch up with friends over lunch. Situated in the Merrion Centre, or on York Place if you’re at the other end of town, My Thai is easy to get to and the Pad Thai dish is highly recommended. For good pizza at a great price, get down to Dough Boys at Belgrave Music Hall. Pizza slices are half price until 7pm Sunday to Thursday and until 5pm Friday and Saturday. Try a slice of the Queen Brie which is French brie with caramelised onions, roasted red grapes, black pepper and smoked sea salt, or the Salami of Darkness which is salsiccia picante and house pickled chillies on a freshly baked slice of dough. If you and your friends really can’t decide where to eat in Leeds, check out Trinity Kitchen. You can still all eat together but the beauty of this place is that you can all eat from separate venues if you want to. Tortilla, Rola Wala and Pho are some of the permanent fixtures here but every month, different street food carts come and go if you want to try out grub from the indie scene. This is one of the restaurants in Leeds you go to if you want to treat yourself or for when your parents come in to town. Whatever you decide to eat from the dinner menu is going to be a delight but we can fully recommend the cauliflower with almonds, romesco and sherry vinegar as a side. If you do want to try out Ox Club but want to be a bit more thrifty with your money, brunch is a great option here as the prices are reasonable but the quality of food is still very high. 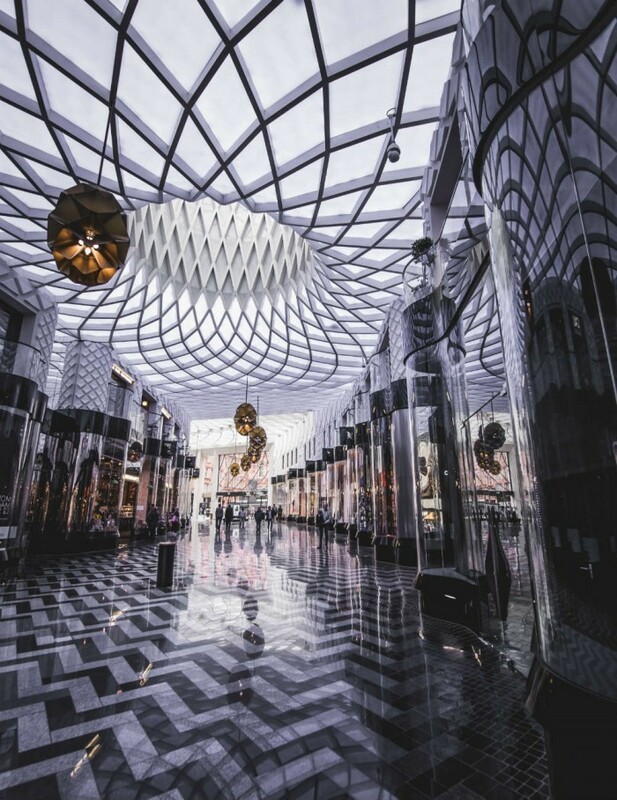 If high-street shopping is more your thing, head to Trinity Leeds. Here you’ll find Topshop, Next, River Island, Apple, Victoria’s Secret, Office, Primark and others all under one roof. This is also where you’ll find Trinity Kitchen and the Everyman Cinema so really you don’t need to go anywhere else in Leeds for a good day out! If you’re being thrifty with your money, vintage shops in Leeds come to the rescue if you’re looking for a wardrobe refresh at a minimum price tag. Blue Rinse is the real top dog of the vintage shops in the city. With four floors of stylish wear, it’s more than likely you’ll come out with more than a couple of new items. Pop Boutique is also a city centre favourite with the Sue Ryder shop in Headingley being a convenient stop if you need something quick for a student night out. 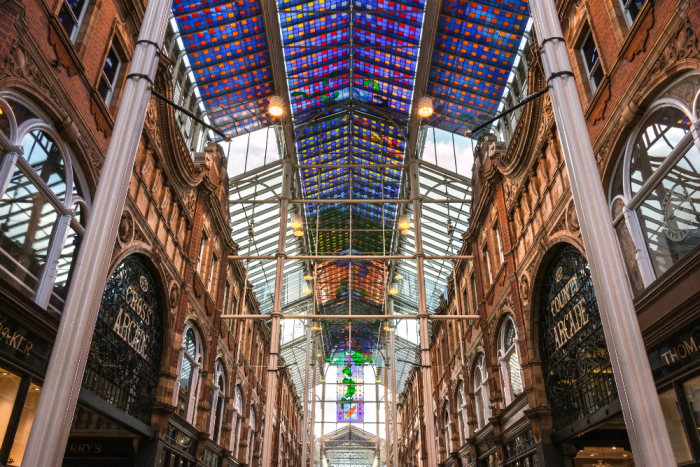 Full of independent shops and cafes, the arcades of Leeds are a joy to walk around even if you don’t want to shop. The ornate decoration is wonderful to look at and each arcade is different so whether you’re wandering through Grand Arcade or Thornton’s Arcade you’ll definitely be impressed with these unique shopping areas of Leeds. Leeds nightlife is epic. You’ll soon find your favourite places to go but if you want somewhere a little different, these bars are a little bit more chilled out than the clubs you might have discovered already. 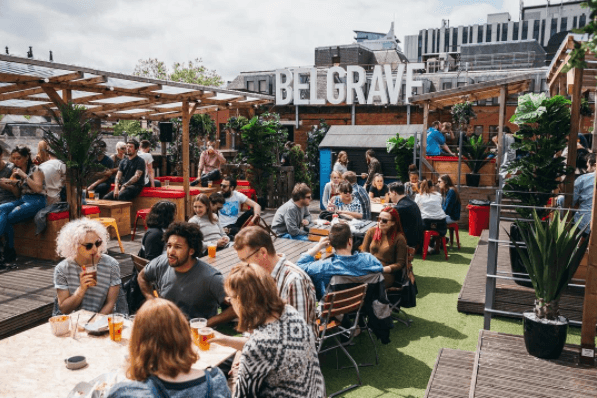 With a rooftop that’s an extremely popular hangout in the summer months and a huge bar that is a well frequented spot by students, professionals and families in Leeds, Belgrave needs to become a staple on your Leeds night out. It’s a relaxed place and if you want a bite to eat, we’ve already mentioned the pizza that Dough Boys serve up. There are also burgers here and the legendary session fries from Patty Smiths too. Around the corner from Leeds’ Millennium Square, Nation Of Shopkeepers is an oh-so-cool bar that has a huge outdoor courtyard – with heaters you can use in the winter months – live DJs and a great pub quiz on a Monday night. It’s always a hub of activity and is definitely a place you can’t miss out on on you Leeds night out. It’s not just shopping and eating in Leeds, there are plenty of things to keep you entertained in the city centre when you’re at a loose end…. It may be a couple of pounds more expensive than the regular cinema but you definitely get more bang for your buck at The Everyman Cinema in Trinity Leeds. This cinema boasts comfy sofas and you can even get pizza and ice cream delivered to your seat with the table service offered by the bar. Now you might not think that Leeds Town Hall is a hive of activity for what’s on in Leeds but this place hosts a variety of events throughout the year. From The Ocean Film Festival to comedy shows by the likes of Katherine Ryan and Jimmy Carr, it’s definitely worth checking out what’s on at Leeds Town Hall for something different to do on an evening in the city centre. Music is one of Leeds’ entertainment strengths. There are several music venues around the city including Brudenell Social Club and Headrow House but the O2 and First Direct Arena are where you’ll find your more mainstream and indie acts acts such as The Killers, Emile Sande and The Pigeon Detectives. If you’re into your arts and crafts, make sure you enjoy an afternoon down at Northern Craft or Northern Print. They’re separate events but of the same nature with local craftspeople showcasing screen prints, hand-made jewellery, cool indoor plants, and clothing that you won’t find anywhere else. Northern Craft hosts events throughout the year at Northern Monk Refectory with The Northern Print Fair at Sheaf Street Cafeteria in November. Independent coffee shops are another key strength of Leeds. You won’t just find Starbucks and Costa here – although there are plenty of those! 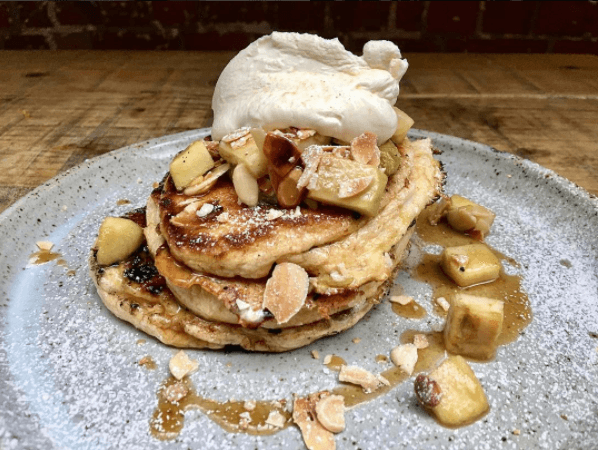 Independents are springing up all over the city but there are a few which are definitely here to stay and we recommend you try them out if you want a change of scenery for studying or just a good cup of coffee. North Star Coffee has been roasting its own beans since 2013 and was the first Leeds based roaster to do so. Since then, North Star has gone from strength to strength by creating unique blends and opening its own coffee shop in 2017. Based down in Leeds Dock, the shop might be a little bit out of the city centre but it’s worth walking to even if it’s just for some home-bakes treats from Noisette Bakehouse. You’ll definitely want to try their Pasteis de Nata but hurry, because when it’s gone, it’s gone! Just around the corner from the train station is Laynes Espresso. Not only can you grab a great cup of coffee and a piece of cake but this place also does the most incredible brunches. The sweetcorn fitters with halloumi cheese, chimichurri and poached egg are a firm favourite on the menu and will have you coming back to Laynes Espresso again and again. Located on the ground floor of Munro House, just opposite Leeds Bus Station, Café 164 prides itself on serving up speciality food and a selection of guest coffee blends. While you’re enjoying a good brew – that can be made with organic, soya or almond milk, take in the arty surroundings of the gallery which includes photography, paintings and sculptures by artists from around the UK. If you’re a fresher in Leeds, what tips to you have for getting the most out of the city?